I have thought a lot about remembering or memory since our son Mack died on New Year’s Eve 2012, two weeks shy of his 9th birthday. Often a memory of a moment between us will bubble up unbidden and in the early days of mourning these would pierce me as a reminder of what I had lost. As the years have unfolded, I have come to relish those moments and even invite them. Recently, I recalled a night when both Mack’s dad and sister were out. It was just the two of us for dinner so I lit candles, pulled out the china, and we sat at opposite ends of the dining table. I have come to appreciate that memory lives in a separate space and at times Mack and I share a moment. Often I laugh out loud and “re-member” Mack’s great laugh and feel his warm spirit because we always laughed together. As I stroll through the stores looking at the Halloween décor, endless bloody knives, skulls, bats, gravestones, and the recent emergence of the terrifying clown, it strikes me that we have a culture steeped in death, but these are images of violent death moments. What these images can’t begin to tell is the story of the mysterious and vibrant relationship we can choose to have with our loved ones beyond death. It is very important to remember those who have loved us and those we have loved. Remembering them means letting their spirits inspire us in our daily lives. They can become part of our spiritual communities and gently help us as we make decisions on our journeys. Parents, spouses, children, and friends can become true spiritual companions after they have died. Sometimes they can become even more intimate to us after death than when they were with us in life. 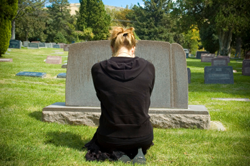 Remembering the dead is choosing their ongoing companionship. As I continue to learn to live with the death of Mack, I have become ever more convinced that we need to give permission to ourselves and our loved ones to speak the names of our dead and to celebrate their contribution to life long after they die. It does not take long when speaking to others in mourning that they too have shared moments, dreams, visions and other gestures of love from the dead that give them tremendous peace. “I don’t tell anyone in case people think I’m weird,” a friend whispered to me about her brother, Grant. To my student who spoke of her high school classmate’s recent suicide. “What is her name?” I asked. To Susan, Grant, Mack and all of our loved ones who have died before us but remain with us, as Sylvia Plath describes, and grow in us like a tree. As we enter into the season of remembrance may we invite them to bear fruit and provide shade to our souls in the most surprising ways. Thank you Elizabeth. You are a courageous woman and inspirational writer.